Carlyle Dental offers dental fillings for residents living in Kinston, Goldsboro, Greenville and the surrounding areas of North Carolina. Fillings are a restorative dental treatment used to repair tooth decay, minor tooth fractures, as well as minimally damaged tooth surfaces. Fillings are one of the most common general dentistry services offered at Carlyle Dental, and are an important way to maintain good oral health. Dental fillers can also be used to even out tooth surfaces in order to improve biting and chewing, as well as to improve or eliminate sensitivity caused by enamel loss. A regular dental checkup can identify these problems in their early stages and can address them promptly with a dental filling, preventing further decay or damage. At Carlyle Dental, an exam that includes x-rays and other detection aids will identify any need for fillings. If cavities and decay are detected, Dr. Carlyle will discuss your options for filling and sealing the cavity to prevent further damage. If the damage is too extensive, alternative procedures may be required, such as crowns, root canals, bridges or implants. Dental fillings are often used in conjunction with these treatments in order to enhance both function and cosmetic appearance. Fillings for residents of Kinston, NC and Greenville, NC can often be done immediately. The area is numbed during preparation, and if necessary, sedation dentistry can be used to ensure you are comfortable and anxiety-free. The tooth and surrounding areas are prepared by removing the decay with a dental drill or laser tool, and is cleansed to remove debris and bacteria. 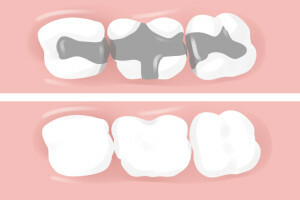 The decayed tooth is also isolated in order to prevent moisture from interfering with bonding. Adhesives are then placed into the tooth, followed by the filling material. Dental fillings are made of several types of material, including composite or porcelain, and can be matched to the natural color of your existing teeth. A special bonding light may be used to harden and cure the filler. The filling is then finished and polished; leaving a restored tooth that is functional and looks natural. Maintaining good oral health is important to your overall physical health, and regular dental checkups at Carlyle Dental are the best way to identify cavities early, as well as to prevent further damage. Restorative dental fillings will help residents of Kinston, NC and Greenville, NC protect their teeth and keep them healthy. How Much Do Dental Fillings Cost in Kinston, NC?